A color of that product is white. Consistency is rich, not easy to soak in, leaves white strikes for quite long while and you should not dress up immediately. Its scent is like an old oil left on the frying pan, which we forgot to wash for few weeks. Is that how Macadamia oil or Shea butter suppose to smell? I could use it only on the lower part of my body as it stinks a bit so it takes away the relaxation element by smelling like old chips. Alverde Korperbutter Macadamianuss did not moisturize well my dry skin and that is its main role- a body butter for a dry skin. I need to admit sadly that it stayed on my bathroom shelf so long that it started to evaporate rather than being used-that only shows that I am not impressed by it. It does not smell nice. It does not work like it should. It cost not much, but I would not recommend it, neither buy it again. Preservatives in this product are a vitamin E and alcohol, that is why we smell alcohol so strongly while application-not a nice experience, if you ask me. If you are obsessed about bio or organic products-go for it-but don’t expect a miracle. It is a vegan product, for those who care. Home spa tip: You can pamper your skin by applying a mix of an olive oil with a rose or orange oil drop and make some moisturizing organic oil at home. 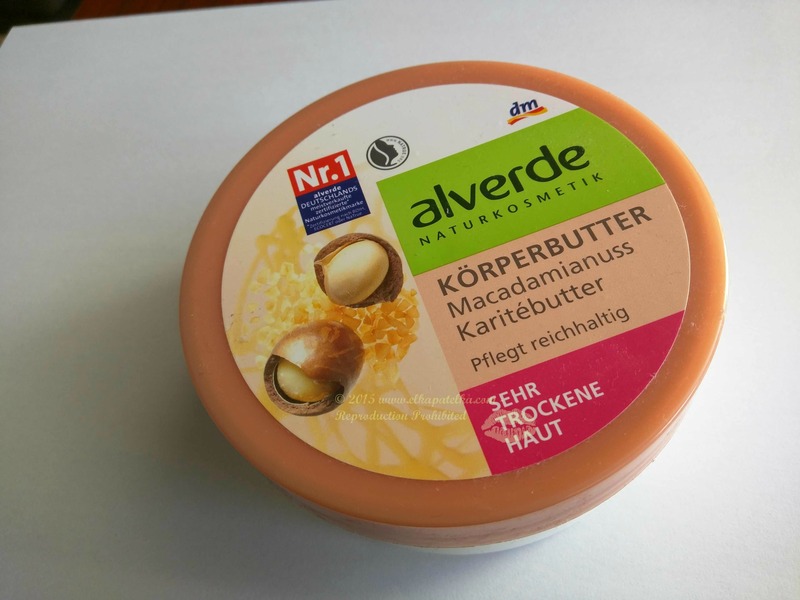 Alverde-DM-you can do better than that body butter. This entry was posted in Alverde, Body butter - Masla do ciala, dm drogerie, Vegan cosmetics and tagged Alverde, body butter for a dry skin, DM Drogerie, Shea butter, Vegan body butter.